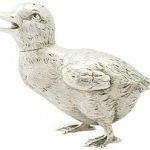 Here at AC Silver we have recently acquired some especially interesting items which are decorated in the traditional Cloisonné enamel style. This type of decoration is distinguishable by its use of bright, primary colours, separated into small sections of colour, which then form large patterns. 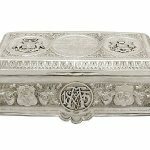 These pieces are especially beautiful and eye catching, and make for a wonderful gift for those who love colour and unusual silverware, or anyone who has a particular fondness or affinity to Russia! 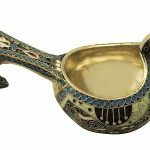 What is Cloisonné Enamel Decoration? 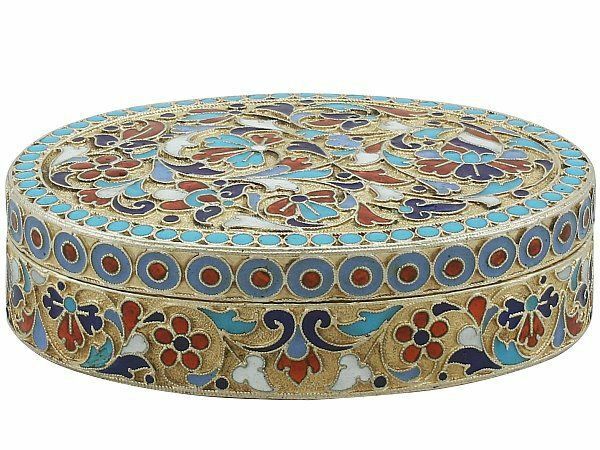 Cloisonné decoration is named after ‘Cloisons’ – which translates to ‘compartments’ in French, referring to the compartments of colour that the decoration is defined by. 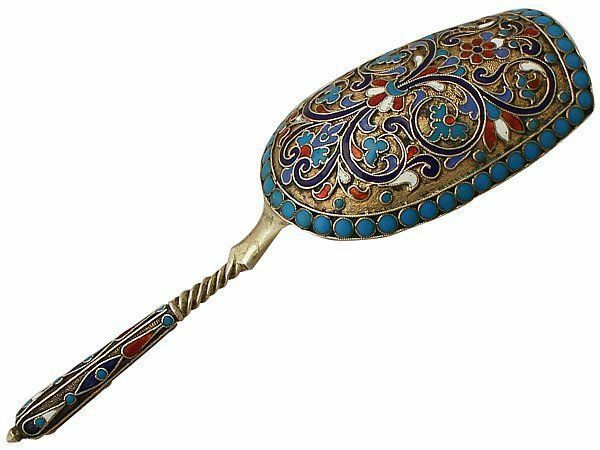 Although the name Cloisonné is French, most antique and vintage pieces found in this style are created in Russia, where this adornment is especially popular. Cloisonne enamel decoration is created by first soldering the wire work to the piece to form the shapes and compartments across the item. Powdered enamel is then made into a paste and applied to the metal within each small ‘cloison’, and the piece is fired in a kiln, where the high temperature melts the paste into an enamel. Through this technique, different effects can be achieved depending on the type of enamel powder used. The maker can use less concentrated coloured powder, which will give the effect of a more translucent colour, resembling a stained glass effect. 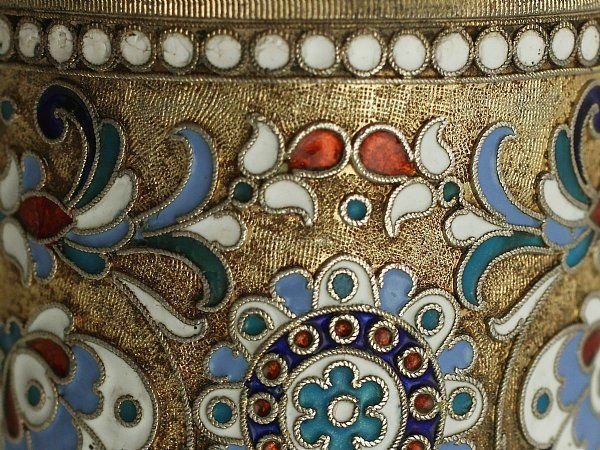 There is evidence of variations of the Cloisonné technique as far back as Ancient Egypt, where Pharaoh’s chest plates were decorated with large, turquoise enamelling. During the Byzantine Empire, the small and delicate wirework was developed and primarily used to decorate items of religious and ceremonial significance. Often, during these ancient eras, most examples of Cloisonné work were smaller pieces, such as jewellery. It was not only powdered enamel which was used to create the Cloisonné decoration effect, but many pieces in this style were made with gemstones and paste stones -glass with a coloured backing which then display the colour of the setting, rather than the colourless glass. The use of gemstones and paste stones in this way was primarily for display, and garnets were commonly used by royalty as they were believed to be a protective stone, so were often inflated into pieces of armour or swords. Furthermore, the garnet was a symbol of the Blood of Christ to those who followed Christianity, so the gemstone was used frequently in cloisonné items which were used within church. 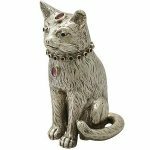 Is Cloisonné Decoration still Popular? 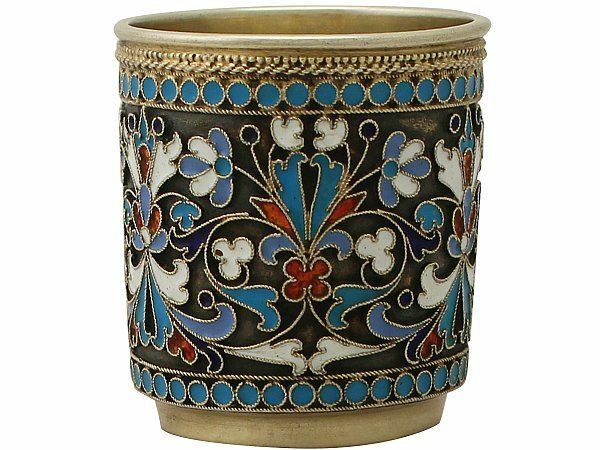 Cloisonné decoration is often contemporarily referred to as Russian enamel, and this is because this style of decoration has continued to be popular in Russia across the nineteenth and twentieth centuries. This type of metal and enamel work is often regarded as being a traditional Russian style, as many aspects of this ornamentation reflect the architecture and stylistic characteristics of Russian art and design, for example, the vibrant colours of the Saint Basil’s Cathedral in Moscow’s Red Square. 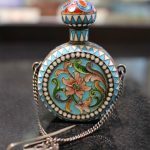 Many of the examples of Cloisonné enamel pieces which we are able to offer to our customers have been created in Russia. The most famous maker of Cloisonné enamel pieces was Karl Faberge, whose infamous Faberge eggs are some of the best quality and most widely recognisable pieces of Cloisonné enamel in the world. 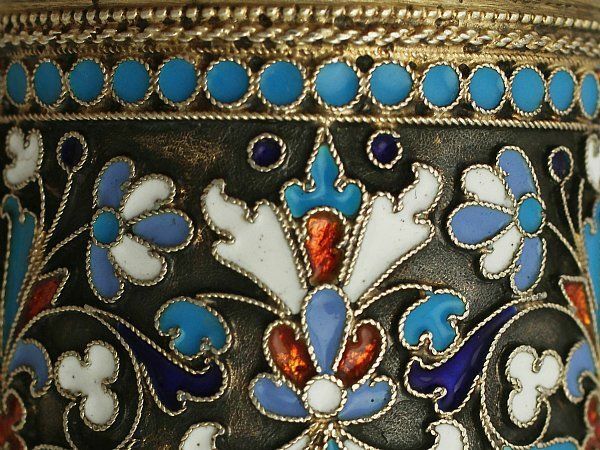 His infamy, alongside the value and craftsmanship which his pieces were famous for, ensured that Russia adopted Cloisonné enamel decoration as it’s own, and that the style would continue to be revered and to represent Russian artistry in the eyes of the world. Thanks for your comment Charis, glad you enjoyed the article.